What Else Can We Learn from Tusks? Tusks grow from the base of the tusk by adding material in a cone-shaped packet into the hollow center of the tusk. 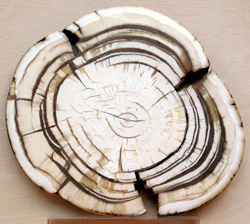 This creates a series of rings, called growth rings. You can see these rings when you look inside the tusk. Each thick ring represents a single year and is made up of a dark band and a light band. The dark band was made in the winter months and the light band was made in the summer months. With a microscope, you can see even smaller, fainter rings that represent weekly or daily growth. Scientists look at the annual growth rings in a tusk to find out what time of the year the mammoth died. They can also find out how healthy the mammoth was during different times of its life based on the size of the growth rings. A thick growth ring means the mammoth ate a lot of food and was healthy. A thin growth ring means the mammoth did not eat very much food because there was little food for it to eat or it was unhealthy. Tusks are an important piece of evidence in telling the story of mammoths. What did Lupe use her tusks for? How big do tusks get? << Back to More about mammoths. This material is based upon work supported by the National Science Foundation under Grant No. 0741583.